Whether it’s for a birthday, wedding, anniversary or just a proper family catch up our private dining room at The Tickled trout is perfect for any occasion and we like nothing better than making your time with us extra special! We have a range of celebration menus to choose from to make life easier for those booking and we will work with you to prepare for your event. 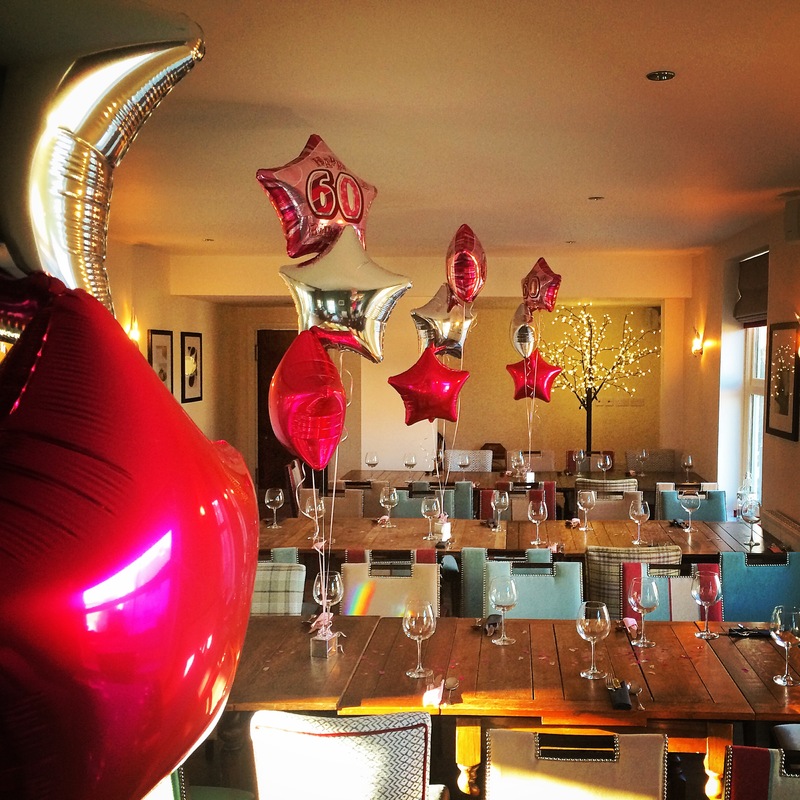 Over the last 4 years we have had numerous memorable private dining evenings in the ‘Top of the Trout,’ the one which always springs to mind was a birthday party which really was the excuse for a surprise engagement! There was also a great 70th birthday where we used our projector to have a brilliant slide show of family photos during the celebration. There were plenty of laughs to hear from the room that evening! The games during a hen party also caused much amusement to the waiting staff! We all joined in as well as with a charity quiz night. The room can accommodate up to 20 around a large table so everyone is together, but the tables can be arranged to suit any private dining needs. You can now take a closer look at our event room through our interactive Google Maps featurette or please pop in – we always like a good party to plan! How about escaping and treating yourself to a break in one of our luxury cottages? Derbyshire is just as beautiful in Winter as summer, the colours over the moors are vibrant and you can’t beat the low mists which sit in the valleys. There are many places to visit, Chatsworth is stunning in the run up to Christmas and the Christmas markets provide an excuse to sample lots of great food and wine and is useful to find those gifts which are just a little bit different. But if you want to avoid the silly season a walk in the Peak District is just perfect. A favourite of mine is walking through Longshaw Estate which is a 10 minute drive from Barlow, let’s be honest, much better than Christmas shopping…. Our two cottages Wellside and The Little Trout are literally next door to the pub and with a 10% discount voucher for the Tickled Trout there is every excuse to enjoy the delicious food and drinks! We can arrange a local brewery tour at our village brewery where you can sample true Derbyshire Ales or recommend plenty of local places to visit. Derbyshire Cookbook – second helpings! This year I had the honour of writing the forward for the second Derbyshire Cookbook “Second Helpings”, an easy task as I just love championing the local produce in our great county. The book brings together the best of Derbyshire food and drink. Chefs from the top restaurants have put together recipes for you to try at home. There are a few great cocktail recipes in there as well. I chose for my recipe a cut of pork which isn’t often used – ribeye. The dish brings together flavours and textures which enhance the pork. The celeriac remoulade and rösti are fun to create and as for what you can do with marmite, love it or hate it, it is my secret ingredient in many dishes! As well as restaurants and pubs there are recipes from local producers such as a tomato cheesecake from Cow Close Farm in Hathersage who produce delicious cheese by hand. There is also a bit of local history in there - did you know the market hall in Chesterfield was originally built in 1857? The book really has a quality feel and the vibrant photos make the book an eye catching addition to any cookbook collection. The book is on sale in The Tickled Trout as well of the other locations which are showcased in the book. At £14.95 it’s a great gift. After winning the Best Out of Town Restaurant in the Chesterfield Food and Drink awards I really was thrilled to bits but the icing on the cake came this week when I found out that the Tickled Trout has won the Derbyshire Life Restaurant of the year and I have been awarded Chef of the Year which was extremely humbling. I am absolutely over the moon and delighted that the tired village pub I bought and renovated nearly 5 years ago has been recognised as the best in our county. My love of cooking started many years ago – taking recipes off Teletext and Ceefax (for those of us who can remember this useful service way before Google!) After working locally I moved to London determined to train with the best. After a while at the Charing Cross and Royal Horseguards Hotel I was lucky to gain a position at Petrus under the extremely watchful eyes of Gordon Ramsay and Marcus Wareing and furthermore the Greenhouse in Mayfair. It was hard graft but lifelong friendships were made there and it made me set my sights high. One of those special friendships was with Paul Ainsworth and after Petrus we set up No.6 in Padstow. Derbyshire is my home though and I made the move back to my home village of Barlow. The Tickled Trout is my passion, using local produce and cooking high quality innovative food is what we do best. I have a great team, both front and back of house and I am incredibly proud of what we have achieved in relatively a short time. The awards will be proudly on display and I will look forward to carrying on our journey going from strength to strength in 2019! Our menus are always evolving and getting better – please check out our website to see if there is anything to tempt you!